Fire Extinguisher is a portable fire fighting equipment which can be moved manually to the fire. It contains fire extinguishing material and is specially designed for the purpose of tackling with fire in its initial stage. In this type of extinguisher water is used as an extinguishing material. 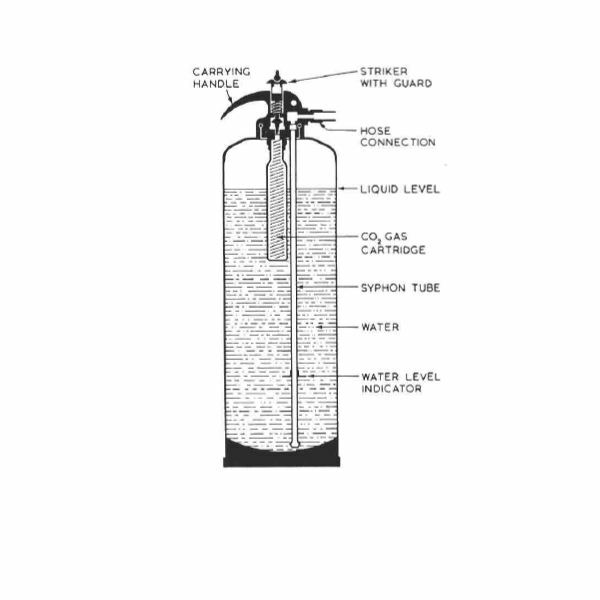 Pressurised CO2 gas cartridge is used to release the pressure which is stored inside the body of the extinguisher. Knob is provided at the top of extinguisher for puncturing the cartridge. As the cartridge is punctured, gas is released from it,which will force the water to come out from the body of the extinguisher. Forced water comes out through the nozzle of the extinguisher in the form of a small jet, which can be projected on to the fire. Water Type of Extinguisher carries 9 litres of water when it filled to the specified level. The gas cartridge is fixed on a holder and the holder is fitted on the cap of extinguisher. The maximum amount of the gas in cartridge is 60 g for a 9 litre extinguisher. In this type of extinguisher water is used as an extinguishing material. Dry air pressurised up to 10 bars is used to release the pressure which is stored inside the body of the extinguisher. The air can be supplied by compressed air cylinders or by certain type of pump. Safety pin, lever arm and hose are provided at the top of extinguisher. By removing safety pin, depressing the valve lever arm, the hose is used to direct the water jet. It also carries 9 litres of water when it is filled up to the specified level.